ENGINE The 250cc engine is designed to be powerful, light and compact. All major components and shaft arrangements are carefully positioned to best suit the performance and handling characteristics of the overall package. 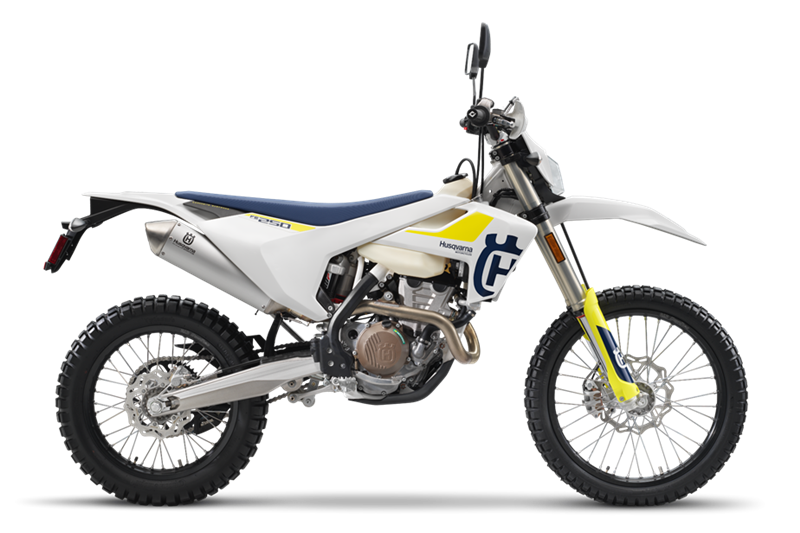 As a result, the engine weighs only 61 lbs while retaining its torquey nature making the FE 250 accessible for both professionals and amateurs. CYLINDER HEAD The cylinder head features advanced technology aimed at reducing weight and drag. As a result, the twin overhead camshafts rotate on a low friction surface while the four lightweight titanium valves (intake 32.5mm, exhaust 26.5mm) are actuated by finger followers using a DLC (diamond like carbon) coating. CRANKSHAFT The plain big end bearing features two force-fitted bearing shells ensuring maximum reliability and durability, guaranteeing long service intervals of 135 hours. CRANKCASE The FE 250 engine is designed to be compact while centralizing rotating masses. As a result, the crankcases are engineered to house the shaft arrangements at the ideal centre of gravity. The casings are manufactured using a high-pressure die cast production process, resulting in thin wall thickness while retaining exceptional reliability. The iconic Husqvarna logo adorns the bronze finished crankcase covers. CHROMOLY STEEL FRAME The hydro-formed, laser-cut and robot-welded frame is expertly crafted by WP Performance Systems. The flex character of the frame is specifically tailored to benefit suspension functionality, handling and comfort. The frame fitted with standard frame protectors and an engine protector which mounts directly to the frame guaranteeing superior protection and durability. COMPOSITE CARBON FIBRE SUBFRAME The composite subframe is a design unique to Husqvarna showcasing pioneering technologies and innovation. This 3 piece component is made up of 30% carbon fiber making it remarkably light (3.1 lbs). Specific care is taken to engineer a calculated rigidity for optimal handling and rider ergonomics. ALUMINIUM SWINGARM The hollow, cast aluminum swingarm is designed to offer optimal stiffness and reliability while adding minimal weight. The machining above the rear axle allows the chain adjuster markings to be seen from above for easy maintenance. 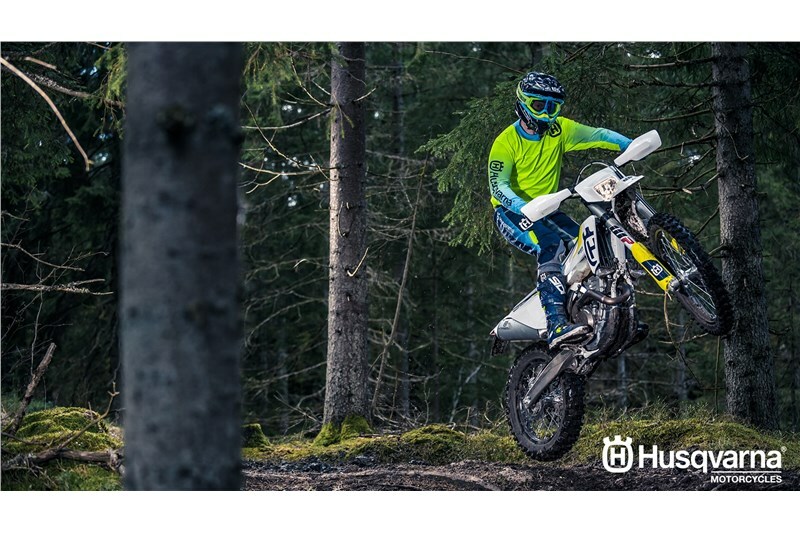 FUNCTIONAL BODYWORK Distinctive and futuristic bodywork highlight the enduro range while striking pearl blue and electric yellow graphics stylishly adorn the Swedish inspired design. The advanced ergonomics provide superior comfort and control allowing the rider to perform at their peak for extended periods of time. WP XPLOR 48 The WP Xplor 48 front fork is developed by WP Performance Systems specifically for enduro type riding. The forks consist of an open cartridge layout with a spring in each circuit and split damping functions. WP REAR SHOCK The WP DCC rear shock is designed to provide advanced damping characteristics while keeping to a compact and lightweight design. With a pressure balance inside the shock, the stroke is more seamless resulting in greater rider comfort and handling while the corrugated outer contour of the reservoir improves cooling. MAGURA BRAKING SYSTEM New for 2018 is a Magura front and rear braking system. The system features a similar layout to the previous design with improved sensitivity for a more modulated feel while still retaining the highest level of performance. 260mm disc front and 220mm rear. PRO TAPER HANDLEBAR The Pro Taper handlebar is second to none for function and style. Manufactured to exacting standards, the Pro Taper handlebar features class-leading fatigue resistance while adding minimal weight. The Pro Taper logos are chemically applied and are scratch and peel resistant. CNC MACHINED TRIPLE CLAMPS The 22 mm offset black-anodised CNC machined triple clamps offer premium quality and style standard on all Husqvarna enduro models. The triple clamps are been expertly crafted using superior techniques and materials to provide high levels of quality and reliability. A 2-way handlebar adjustment is standard and allows for customisable ergonomics. ELECTRIC STARTER A standard electric starter guarantees easy starting in all situations. The system is powered by a lightweight and powerful Li-Ion battery which is 2.2 lbs lighter than conventional lead battery. MAGURA HYDRAULIC CLUTCH The reliable, high quality, German-made clutch system guarantees even wear, near maintenance-free operation and perfect modulation in every condition. Meaning that play is constantly compensated so that the pressure point and function of the clutch remains identical in cold or hot conditions, as well as over time. 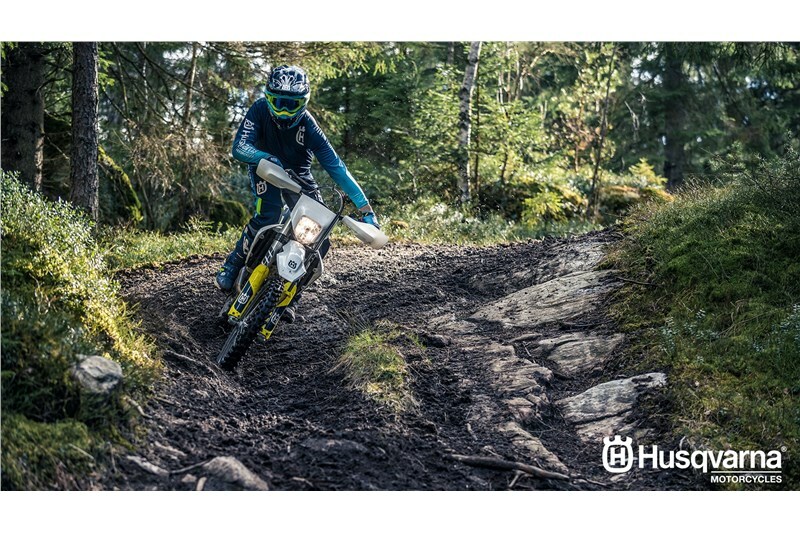 SELF CLEANING FOOTPEG MOUNT The Husqvarna frame features a clever, self -cleaning footpeg mount which prevents the build-up of dirt collected through deep ruts or muddy terrain. As a result, the footpeg will spring back into its original position ensuring perfect control. The large aluminum footpegs have an Enduro specific grip pattern while the position of the pegs is 6mm higher than that found on the MX models to further increase ground clearance over rocks and deep ruts.